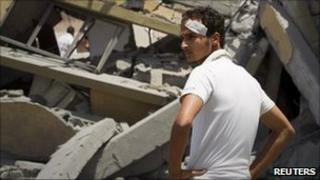 The Libyan government has accused Nato of killing dozens of civilians in an attack on a village in western Libya. Col Muammar Gaddafi's administration said Nato bombed Majar, south of the city of Zlitan, on Monday to allow rebel fighters to enter the area. Officials say 85 civilians were killed, but Nato says the target was a military one, with civilian deaths unlikely. A BBC correspondent says he saw about 30 body bags at a local hospital, but it was unclear how the people died. In a statement, Nato confirmed that it had carried out an air strike south of Zlitan on Monday night, but insisted that the target was a military staging area. "Nato had very clear intelligence demonstrating that former farm buildings were being used as a staging point for pro-Gaddafi forces to conduct attacks against the people of Libya," the statement said. It is difficult out here in the Libyan countryside under the baking summer sun to gauge exactly what happened. Our government minders first took us to a remote collection of buildings south of the town of Zlitan. There has clearly been a series of air strikes. The dwellings have been hit hard, reinforced concrete lay in a tangle. The front line is just a few miles to the east towards the rebel stronghold of Misrata. Plumes of smoke could be seen on the horizon. The Libyan information minister told us the buildings lay on the only route that the rebels would be able to take if they wanted to enter the town of Zlitan. That was why they were targeted. "We do not have evidence of civilian casualties at this stage, although military casualties, including mercenaries, are very likely owing to the nature of the target," it added. Coalition forces began operations in Libya under a UN mandate authorising military action for the protection of civilians. A spokesman for Col Gaddafi's government, who took foreign reporters to the scene of the strike, said 85 people had been killed, including 33 children, 32 women and 20 men. "[Nato forces] do not differentiate between soldiers, children and old people," Abdulkader al-Hawali, a fifth-year medical student at the hospital was quoted as saying by Reuters news agency. The BBC's Matthew Price says he saw about 30 white body bags at the hospital, while on a guided government tour. Half the bags were opened to the media, he says, with the majority revealing men of fighting age, and also two children and two women. Journalists were also taken to a rural location south of Tripoli, where they were shown isolated buildings that had clearly been struck from the air, causing considerable damage. There were the remains of a bed, sofas and pages of schoolbooks fluttering in the breeze amid the debris, our correspondent says, but it was difficult to gauge exactly what had happened. At the hospital, 15-year-old Salwa Jawu - whose name appeared on the school notebooks back at the homes that were hit - said her mother, two sisters, her brother and his wife were killed in the air strikes. She has a broken shoulder and wounds on her face. "I don't know why they would attack us," she said. "We are civilians." Over recent weeks, the rebels have been slowly advancing on Zlitan from the port city of Misrata, 70km (45 miles) to the east. From Zlitan, their intention is to advance about 160km (100 miles) along the road to Tripoli.